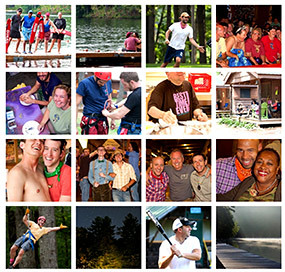 Since 1997, ‘Camp’ Camp – America’s premier summer camp for LGBT adults – has offered a fun and distinctive vacation for the gay, lesbian, bisexual & transgender community. Structured just like the sleep-away summer camp that you remember from when you were young(er), Camp offers a full program of great outdoor, athletic, and arts & crafts activities along with a variety of entertaining evening social events. Located in scenic southwestern Maine, ‘Camp’ Camp is the perfect alternative vacation for adventurous members of the LGBTQ community looking for a unique vacation option beyond the usual gay cruise or resort. Our Campers say ‘Camp’ Camp is the best time ever – and who are we to disagree?! A week at Camp includes all activities, meals and accommodations – plus, all the new friends you can handle! 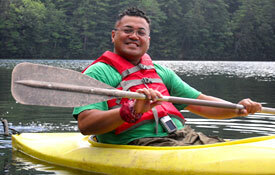 With a wide variety of traditional summer activities such as mountain biking, pottery, hiking, lake swimming, sailing, stained glass, canoeing, and softball – along with offerings geared towards our adult clientele such as Broadway dance and figure drawing – you’re sure to find something to keep you active and challenged, returning home relaxed and renewed. Camp is the perfect place to rediscover the kid in yourself – and maybe even discover the athlete or artist you didn’t know you were. Accommodations are rustic, but comfortable: cabins with bunks, electricity, and attached bathrooms with private shower stalls, shared by groups of 5-20 men or women along with one gender-neutral/co-ed option. While the cabins are indeed camp-like, the food is not: our professional chef makes a special effort to make all the food plentiful, healthy, and delicious with an emphasis on locally-sourced ingredients. 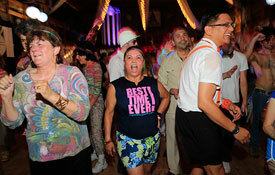 Each year, Camp is typically attended by over 200 men and women, ranging in age from 21 to their 70s. 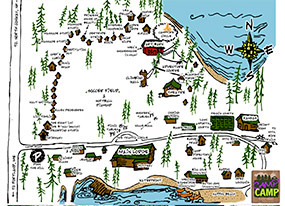 While the majority of Campers have historically come from the Northeastern U.S., we regularly welcome Campers from as far away as California, Georgia, Washington, Illinois, Michigan, and Arizona, along with international vacationers from British Columbia, Ontario, and the U.K.
Once you come to Camp, you’ll probably want to come back. 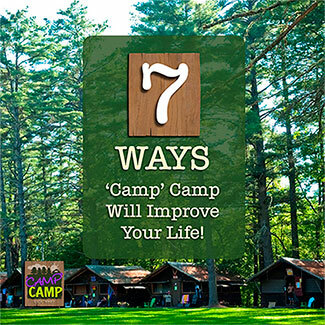 About 75% of people who come to Camp return for at least one more year, if not two or three or more. In fact, in 2016, over 45% of our Campers & Staff had been with us for five years or more. Since its inception, Camp has grown into a community of people – people who identify as gay, lesbian, bisexual, transgender, queer, questioning, or somewhere in between – who enjoy a variety of social, athletic and cultural activities together throughout the year. 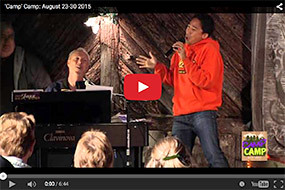 You can read all about the Camp community and how a week at ‘Camp’ Camp is more than just a vacation here. Once you’ve decided to come to ‘Camp’ Camp, we make registration simple with our convenient online registration and payment via credit or debit card right here on our website. We even offer automatic payment plans to make attending Camp easy on your budget. In addition, we have a fee schedule that fits just about every budget, thanks to our unique Staff Program. About half the people who attend Camp each year do so as part of our Staff and pay reduced fees in exchange for working at Camp. Our ‘join our staff’ page explains our staff program in detail and includes a list of available positions and a convenient online staff application form. or call 347-453-5257. One of the Camp Directors is always happy to chat with you. We hope you’ll join us in August and discover for yourself why ‘Camp’ Camp is where summer is still the best time ever!